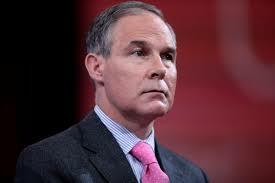 Environmental Protection Agency Administrator Scott Pruitt has backed out of a keynote speaking engagement at the Oklahoma Republican Party Gala, according to a report by News9.com. The former Oklahoma Attorney General confirmed his decision to withdraw from the event during a radio talk show on Thursday morning. The OKGOP affair is set for May 5 in Moore. Senator Sheldon Whitehouse, a Rhode Island Democrat, filed a formal complaint on Tuesday with the Office of Special Counsel. Whitehouse alleges Pruitt’s attendance at the gala would violate federal law – namely, the Hatch Act. The Act limits specific participation in political activities by executive branch employees, who are prohibited from allowing the use of their official title in connection with fundraising activities. At issue was whether the invitation solicited political contributions. Although the EPA’s ethics counsel approved Pruitt’s speaking engagement appearance, it appears that that OKGOP inadvertently violated the federal law. OKGOP Chair Pam Pollard took a difference stance from Pruitt. She insisted no laws were violated. “We believe we know the rules,” said Pollard. Pruitt has been the target of several recent attacks. The Oklahoma Bar Association is investigating Pruitt over an ethics complaint regarding testimony at his confirmation hearing concerning his use of a private email address while conducting official state business. Earlier in February, Pruitt was raked over the coals by an Oklahoma County district court judge who admonished the state’s top legal counsel over a lengthy delay in releasing data under the Oklahoma Open Records Act. Prior to his confirmation and following the release of thousands of emails, Pruitt became the lightning rod for environmental groups that questioned his close ties to oil and gas industry leaders.